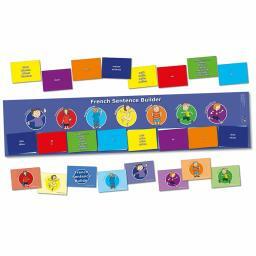 To support the National Curriculum for Foreign Languages requirement that ‘pupils should be taught to write phrases from memory and adapt these to create new sentences’ and to ‘understand basic grammar’, this set has been designed to enable pupils to identify parts of speech and to create simple sentences in French. The poster and cards are colour-coded to aid in the identification process. Use the poster to sort the cards into the relevant parts of speech; the sentence frame at the bottom of the poster can then be used to structure sentences using the cards provided, or pupils can create their own.